Wow, where did November go? I can not believe how quickly it has passed. I know it has been a few weeks since my last recipe post but so many things happened in my life. I started a new job a month ago which I love! It is amazing when you find a job that makes you excited about Monday mornings. Then in order to be able to get to work I bought my first car which is thankfully a 4×4 as the snow has arrived very early this year in Scotland. I also met someone who had an enormous impact on my life. They came into my life very briefly but in a number of ridiculously bizarre ways was the important person I have ever encountered in my life and probably always will be. I feel incredibly lucky for every moment I shared with this person but at the moment I am very sad that they can no longer be part of my life. Finally back to the reason for this post! This recipe is yet again inspired by my love for beetroot. 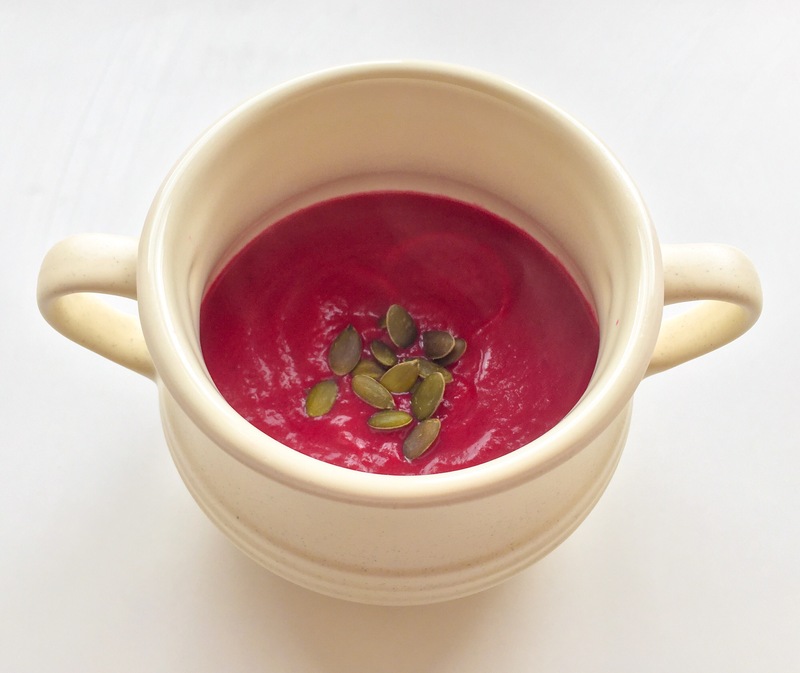 I really do think beetroot is a brilliant vegetable and makes wonderfully vibrant soups on grey winter days. The beetroot goes really well with the orange and tarragon in the soup. I love having a pan of soup simmering away and homemade cheese scones on cold wintery Sundays as they are perfect to have after a walk down to the lochs in the snow. I am finding the autumn light levels a challenge for taking beautiful pictures of my food as it is getting dark very early now, especially now that the clocks have changed. I try to use natural light when taking photographs so I am having to experiment in order to still take amazing photographs. I was going to try some candlelit Christmas food photography this weekend but I am going to go to Edinburgh to see my brother and visit the Christmas Market instead! Pre-heat the oven to 180C. Place the beetroot, garlic, thyme and a drizzle of olive oil on a sheet of baking parchment, then wrap up to form a parcel. Place the parcel into the oven and cook for 30-45 minutes (depending on the size of your beetroots). Once the beetroots have cooked remove them from the oven and leave to cool for a few minutes, then peel the skins off the beetroot, they should peel/rub off very easily. Finely chop the onion and sweat down gently with some olive oil on a low heat in a pan. Once the onion has softened add the rest of the ingredients, including the garlic and thyme from the beetroot parcels. Bring to the boil and then reduce to a simmer. Cook for 20 minutes, blitz, then season with salt and pepper.